We need a positive thread about the new up coming release of the exciting all new generation of BMW S1000RR. There are those of you out there that have good access to release photos. Some of us are not on Instagram, Facebook, Europe social media, and many other sources today of how news gets around. In a positive constructive manner of sharing information however, we can all come together on the product we love and want to spend many thousands of dollars on. Lets share the positive release aspects of the new 2020 release of the BMW S1000RR. Lets start with product information as we know it. Europe was slightly ahead of USA with the release of the 2015, so I would expect Europe to see the 2020 maybe even as a 2019 release product. BMW has not put a year model label on the new bike anywhere I can find. 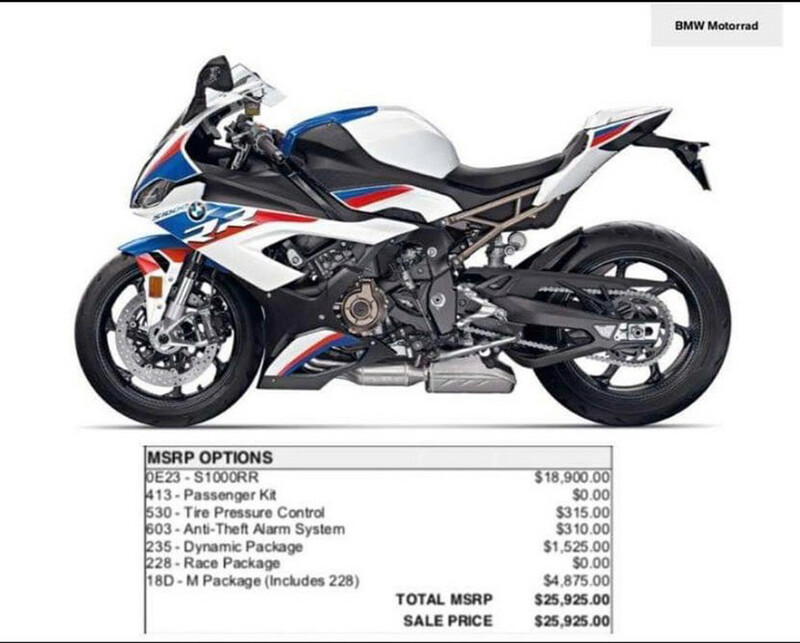 USA already has a 2019 S1000RR so for sure, the new release is a 2020 model as per information by a local dealer. @andyf provided : https://www.bmw-motorrad.co.uk/en/mo...00rr-2019.html ... BMW have sent a memo to UK dealers (I assume that the rest of Europe will be the same) stating that the release date will be 1st June 2019. I have been told this by 2 separate dealers. BMW's UK website lists the new bike as the "S1000RR 2019". BMW's UK website has shows all the options and prices (for the UK). Colours are red for the base model and the Sport model, and motorsports colours for the M package. The new designation for the 2020 is K67 no more K46 in case you did not know what the 2010-2019 was called. BMW website : you've got 152 kW (207 HP) underneath you. Unbridled power pushes your RR to the max - with a maximum torque of 113 Nm at 11,000 rpm and a torque curve of at least 100 Nm over a range of 5,500 to 14,500 [rpm]. The 2020 will have an " M " package platform release add on. It appears right now it is only called M package on the Motorrad color S1000RR. The 2020 has the new TFT cluster which is the same cluster as on other BMW 2018/19 bikes. The 2020 will be called a GEN3 according to BMW press release information. This is not consistent with previous thoughts that the 2015 was GEN3 over the previous models of 2010-2014 being GEN1 and GEN2. It appears dealer information released in 2015 about the new 2015 was not correct in generation platform presentation. There is Race Package, Dynamic package. If the Shift Cam technology on the new 1250 is any indication of how the new RR engine will make power, it's going to be stellar. If you ride a 1200 and 1250 back-to-back, which I have (I use to sell them), you immediately notice how the power is delivered and where in the rev range (read; sooner and at a higher percentage). Smooth as silk, too. I'm thinking a power curve akin to a current combination of R and RR, but pumped up a bit! What’s ShiftCam? It’s the Variable valve timing system introduced on the redesigned 2019 BMW R1250GS that employs a camshaft with two different lobes manipulating each of the eight intake valves. Applied to the S1000RR, the system utilizes partial-load lobes below 9,000 rpm to boost engine torque while also reducing excess mechanical noise and increasing engine efficiency (BMW claims a 4-percent reduction in fuel consumption). The 2020 will have an all new ECU. The label name of the ECU is BMSO. The MPU is still the same TC1793 from the BMSMP and BMSMS used in the 2017-19 S1000RR. The ECU is slightly larger than all previous S1000RR ECU's. Send me a PM if you want your USA model to make 207HP ECE levels of performance. I have it figured out already on this issue. I have the BMSO ECU and the TFT cluster for development. All I am waiting on is the 2020 EWS ignition switch still. 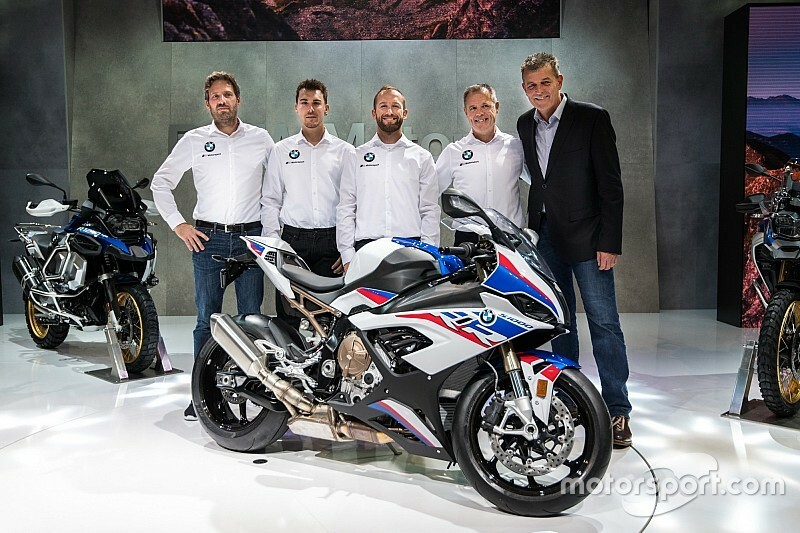 World Superbike say hello to BMW again for 2019 ! Go Tom and Markus ! Former World Superbike champion Tom Sykes will join Shaun Muir's team next season alongside Markus Reiterberger as it rekindles its previous partnership with BMW. BMW’s hell-bent on returning to the top step of the liter-class Superbike podium next season with its all-new 2020 S1000RR. Next year’s/this year of racing in WSBK ( http://www.worldsbk.com/en/news/2019...VUDFvYELtxmxVA ) on the new machine is the third major iteration of the German brand’s superbike and also marks its 10th year of production. IF YOU HAVE A PROBLEM WITH THE COLORS OF THIS 2020 S1000RR > THERE IS A THREAD ALREADY MADE SO YOU CAN COMPLAIN AND POST THERE ! PLEASE USE IT. There is no real official release information that there is only 2 colors available right now, but, with all the pictures on BMW motorrad website, it sure looks like only two options on first release. Elk, smash adams, skapan and 18 others like this. Last edited by BMW_388; 02-10-2019 at 04:30 PM. Can't wait to hear road reviews of the bike. smash adams and BMW_388 like this. I am chomping at the bit to get pricing information for the US. Does anyone know when the international press will be able to ride the new bike? I’m sure there will be a press launch at some sunny racetrack soon. smash adams, wfo439, CYCLE_MONKEY and 1 others like this. It is rumored by some dealers that maybe the pricing and available delivery date will be announced at this event, or, just shortly there after direct to the dealers. Maybe someone can attend and post live some information from there. smash adams and TT C6 like this. smash adams, wfo439, BMW_388 and 1 others like this. I think this is a great fresh start about the highly anticipated bike. Let's keep this positive momentum going. Thank you @BMW_388! smash adams, wfo439, BMW_388 and 2 others like this. This a great start, thank you BMW_388! I'll add some bits that were lost from other thread. - Troy Corser's coaching school will have new RR for their track days starting in April in Europe, US prices and availability to be announced after Chicago show. Wonder when CSS will have the new RR. jmatta33, wfo439 and BMW_388 like this. Give us an update on CSS https://superbikeschool.com/ for the 2019 class season and product line. jmatta33 and wfo439 like this. Last edited by BMW_388; 02-10-2019 at 03:27 PM.